Fortunately, a better way than searching census records on microfilm for hours does exist for U.S. census records: census indexes. A census index contains a listing of the people who are included in particular census records, along with references indicating where you can find the actual census record. Back in the day, these indexes were in book form, but you can now find these indexes online. Although no single website contains indexes of all available census records for all countries (at least not yet), some sites contain substantial collections of census indexes. So how do you find these online indexes? Well, you have a few ways, depending on whether you want to use a free site or a subscription site. The easiest way, if you have the financial means, is to subscribe to a site that has indexed census records that link to images of the census microfilm. These sites include Ancestry.com, Archives.com, FamilyLink.com, findmypast.com, and MyHeritage. These sites are at various stages in indexing, so you want to make sure that you look on the site to determine whether the year you’re looking for is available. 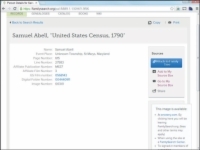 If you don’t want to pay a fee to access census indexes online, you can use a combination of sites to locate your ancestor in a census index and then find the matching digitized copy of the record. It may take longer to find information on your ancestor, but you can use the census indexes at FamilySearch to determine what page and film number your ancestor is on, and then use the free site Internet Archive to view the digitized record. 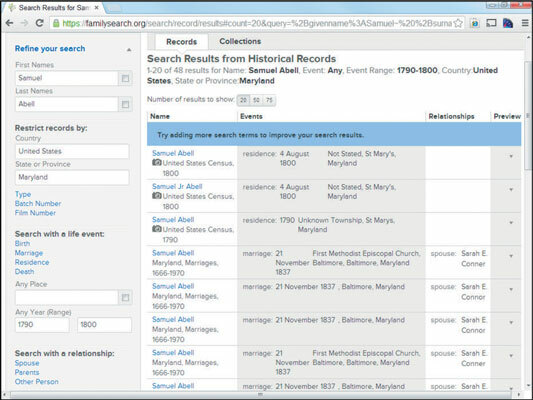 1Point your web browser to FamilySearch. Click Search at the top of the page. The Discover Your Family History search page appears. 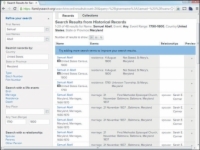 Under the First Names and Last Names fields is a list of links to restrict the records searched. 2Click the Type link under the Restrict Records By section. Several check boxes appear under the Type heading. 3Select the Census, Residence, and Lists check box. A check mark appears next to your selection. 4Type your ancestor's name in the First Names and Last Names fields. Samuel was typed in the First Names field and Abell in the Last Names field. 5To refine your search, type a country into the Country field. In this example, you type United States. A State or Province field appears. 6Type a state into the State or Province field. 7Under Search With a Life Event, click the Any link. A new row appears with an Any Place heading. 8Under the Any Year (Range) heading, type a year in the From field and in the To field. Then click the Search button. Type 1790 and 1800, respectively. The search criteria yielded 48 results, with the most relevant near the top of the page. 9Click a name that interests you. 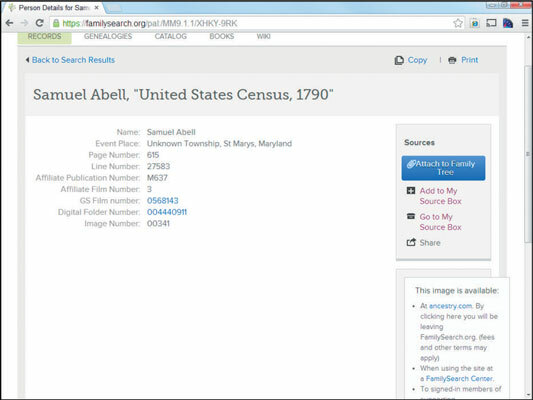 Select Samuel Abell in the United States Census, 1790 in St. Marys, Maryland. The record page appears. Record the information in the Event Place, Page Number, Affiliate Publication Number, Affiliate Film Number, and Image Number fields.